Le Bon Garçon came into my life serendipitously earlier this month. After dropping off my bacon almond brittle at the Bake Sale For Japan, I perused the treats lining the tables to procure a stash to bring home. 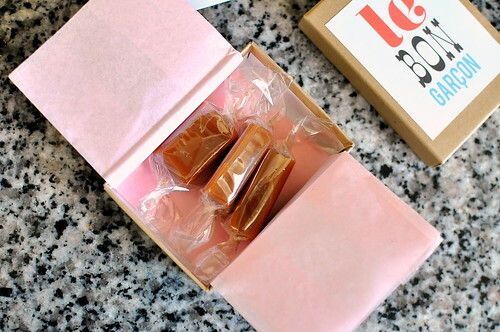 I picked up a jar of Meyer Lemon and Meyers Rum jam from Mothercluck, a Brown Sugar Cinnamon Pop-Tart and a Peanut Butter Crispy Bar from Tuna Toast, and on a whim, I snatched up a box of salted caramels from Le Bon Garçon. While I was familiar with the former two contributors, Le Bon Garçon was completely new to me. I love cute packaging and adore salted caramels even more, so I figured that I couldn’t really go wrong. I held off on trying the caramels until the following Monday afternoon. My intention was to only eat one and save the rest for later, but once I tasted how amazing they were, there was no turning back. All three caramels were down my gullet in five minutes flat. No joke. 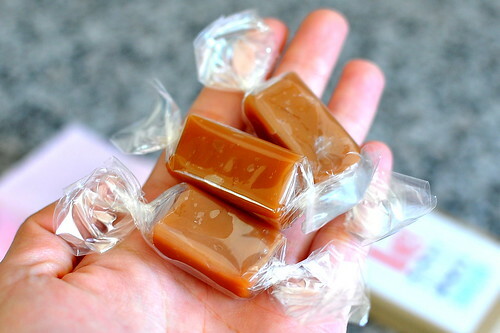 They were truly the best caramels I’d ever eaten. What made Le Bon Garçon’s product incredibly special was its silky texture. The caramels were pleasingly chewy without being overly sticky. My molars were left caramel-free in the aftermath of my binge, which is quite a feat in the world of soft candies. In addition to its superior texture, the caramel’s flavor was rich, buttery, well-balanced, and just salty enough. After polishing off my supply much too quickly, I went online to learn more about the talented pastry chef behind Le Bon Garçon. Justin Chao launched the gourmet caramel company after studying pastry arts at Bellouet Conseil in Paris and 3-star Michelin Le Meurice. He founded Le Bon Garçon in 2010 upon returning home to Los Angeles. The time Chef Chao spent in France greatly influenced his craft. All of Le Bon Garçon’s caramels are made from scratch using the best ingredients and no preservatives. Every batch is painstakingly stirred by hand and meticulously wrapped. It’s quality you can really sink your teeth into. I had the opportunity to try Le Bon Garçon’s other flavor offerings at a recent Artisanal L.A. event. The mango passion fruit caramel had the same great texture as the salted one did, but it hit a totally different note flavor-wise. The caramel was bright, tart, and tangy. It was what all Starbursts hope and pray they will one day grow up to be. The macadamia nut variety was excellent as well. The nutty shards balanced out the caramel’s sweetness and added a bit of crunch to the mix. Of the three flavors offered, I personally fancy the salted one best. But truth be told, the entire suite is all quite sweet. 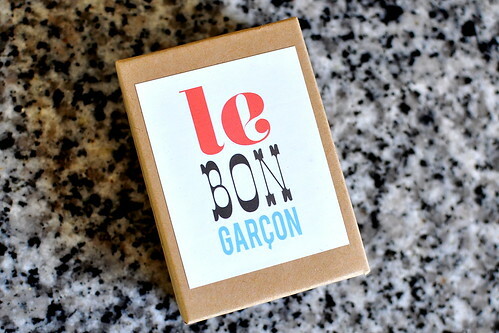 Le Bon Garçon’s caramels are available for purchase online and at select stores in Santa Monica. Yes! 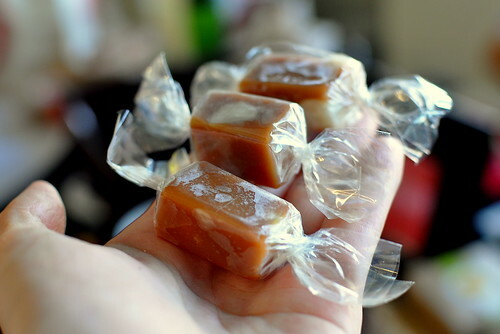 I tried these caramels, too, and I loved them. I especially love that you don’t have to risk your teeth to eat them. I like caramel but I hate when they get stuck on my teeth! 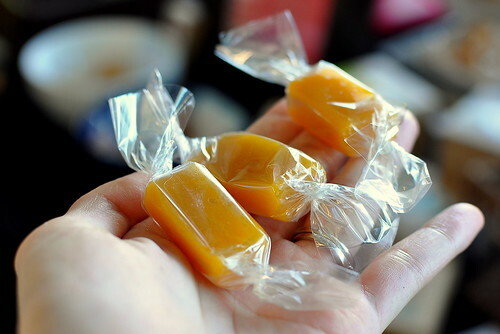 Wow, I love the idea of mango-passionfruit caramels… It boggles the mind, truly! I have traveled to 83 countries and these are definitely the best caramels I have ever had…. hands off them before I get to the post office.